Here in the Southern USA, we eat a lot of pulled pork. In our family, it’s one of the go-to meals for a group dinner or party, as it’s easy to make a big, tasty batch for a crowd. In the South, it’s traditionally smoked + served with barbecue sauce. And while I love the Southern version, I’m equally enamored with the Mexican version, called Carnitas. With Carnitas, generously-seasoned pork is slowly-braised-until-tender (traditionally in lard, but this recipe uses water + citrus juice instead to cut down significantly on fat), then served with warm tortillas. Yum! While this version is leaner than the traditional version, it absolutely does not lack for flavor – it is truly amazing. Despite the short ingredient list + fairly simple preparation, the pork is bursting with delicious, bright, citrusy flavor. After cooking in the oven until fall-apart-tender, the pork is shredded + popped under the broiler for a few minutes. The end result is super tender pulled pork with a wonderful, slightly-crisp, caramelized exterior. Swooooon. I like to serve mine with warm corn tortillas, beans, rice (either this Mexican Rice or this Cilantro-Lime Rice), + my favorite taco toppings. It is also great in burritos, quesadillas, and on nachos. Mmmm. It always gets hugely rave reviews, + gobbled up by both the adults AND the kiddos. 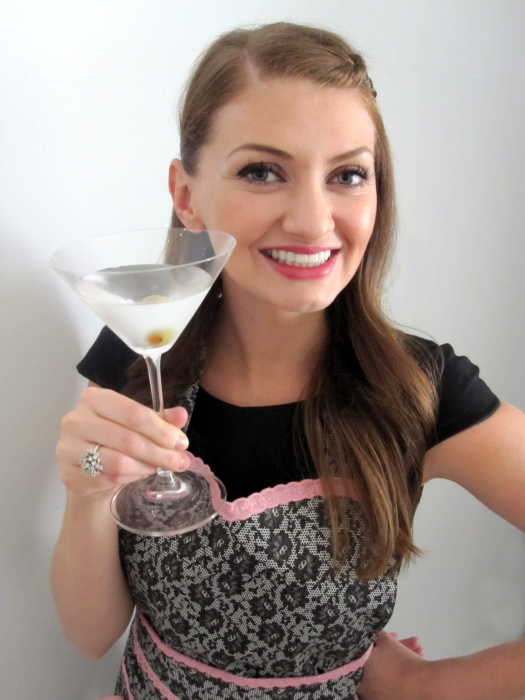 Y’all have to give this recipe a try – I know you will love it! And in fact, it’s already on our dinner menu plan (again!) for later this week. In a Dutch oven, stir together the water, cumin, oregano, bay leaves, + onion. Squeeze the lime juice and orange juice into the Dutch oven, AND toss the squeezed lime/orange halves in. Stir in the pork. On the stovetop, heat the ingredients they simmer, stirring occasionally. Once simmering, cover the Dutch oven + place it in the preheated oven. Bake for 2 – 2.5 hours, stirring once halfway through, until the pork is cooked through and fall-apart tender. Remove from the oven and remove the pork from the Dutch oven, transferring to a bowl. Keep the cooking liquid in the Dutch oven, but discard the bay leaves, onion, orange rinds, and lime rinds. On the stovetop, bring the remaining cooking liquid to a boil over medium-high heat. Boil until the liquid has thickened and reduced to about 1 cup, about 10 minutes. Turn oven to broil and lower racks to near the bottom of the oven. In the bowl, pull each piece of pork in half using two forks. Pour in the reduced liquid and add salt and pepper to taste. Place the pieces of pork on a wire rack on a baking sheet (we used cooling racks that we had for baking, which worked just fine). Broil the meat for 5 to 8 minutes on each side until well browned. Serve immediately in the tortillas of your choosing. We make carnitas a lot – it is definitely one of our favorites! Your carnitas look so tempting! I must have….! Love that you’re serving this with so much cilantro too! 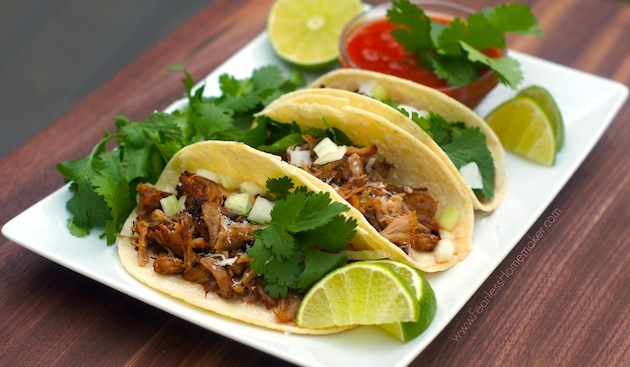 Love, love, love carnitas with tacos! I usually just toss my pork in a crockpot so I can be lazy and have it cook at home, but I am sure the oven-roast brings out great flavor. Trying soon! You know I love my crock-pot, and that’s how I do Southern Pulled Pork at home (because we don’t own a smoker)! But for Carnitas, I love love love the oven method, especially that last few minutes of broiling. Mmmmm. Pulled pork is delicious, no matter how it’s served. This dish is new to me, but I’m sure I’d love it too! These carnitas look incredible, Amy! I love that you lightened it up with water and citrus juice! It still looks super delicious and full of flavor! I can’t wait to add this to our dinner menu! Yum!! 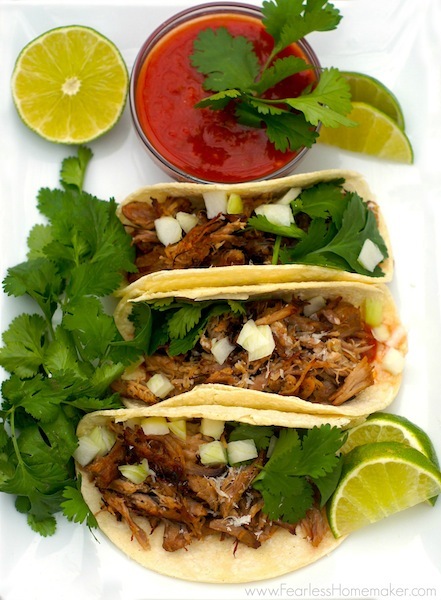 We LOVE carnitas – they are so good. Your version looks delicious! lovin tender stringy pulled pork carnitas!! !